Siphon coffee is coffee brewed through a siphon. It’s basically the most steam-punk way to drink coffee and tastes amazing. Way back in the 1840s, people noticed that boiling water in the coffee grounds made the flavor taste a bit… burnt. A French housewife invented a special vacuum pressure percolator to help preserve the flavor of the roast. The result is a delicately-nuanced tea-like coffee. Guys, I’m so tired. I need energy or a nap or just more time. Life is such a whirlwind and I love every minute of it. My sister needed a little bit of that in her life, so I scooped her up last week and we spun into Siphon Coffee and other mischief. A siphon coffee maker has two components: a bulb as a coffee pot at the bottom and a glass bowl on top as the hopper. A narrow spout connects the two pieces, with a filter in between. To prepare siphon coffee, soak a filter in warm water for five minutes and put it at the bottom of the hopper. Fill the pot with water, and slide the neck onto a siphon coffee stand. Place the hopper on top of the bulb. Use the coffee stand to line the pot up under a burner, and light the burner. The water in the pot will heat and rise into the hopper. While this is happening, grind up some gourmet coffee beans. A good rule of thumb is one to two tablespoons per cup of coffee. Once most of the water has moved to the top, turn the heat source down. Pour the ground coffee into the hopper. Let it brew for about 10 minutes, then turn off the heat source and briskly stir the grounds with a paddle for a few whisks. As the water cools, it will sink down to the pot. Serve warm with no cream or sugar. It was good coffee. The barista said our brew had notes of jasmine grapefruit and oolong tea. Plus, we ordered this great Mediterranean spread with hummus and olives and pears and all of the things. Even though the whole experience is maybe overly pretentious, no one made me feel like it. It was definitely a nice treat and a great early Mother’s Day treat to get my sister out of her house with her four kids. 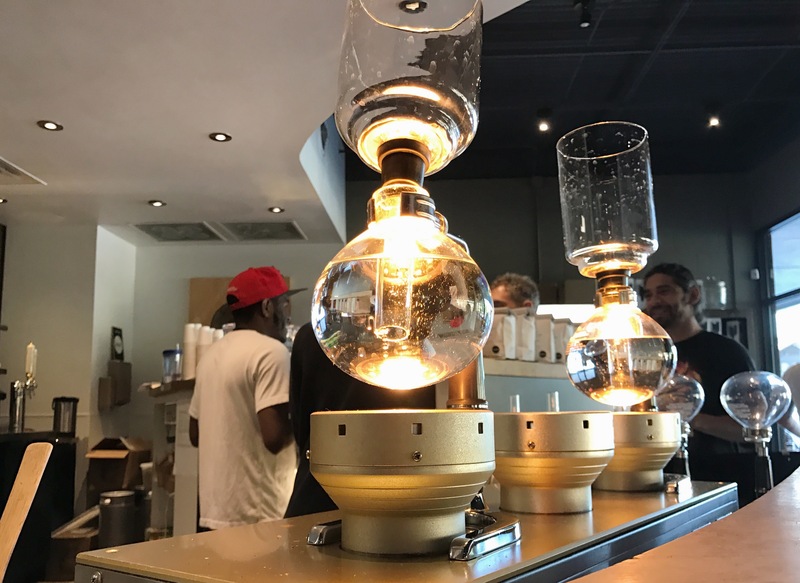 If you don’t have a siphon coffee house near you, it’s pretty easy to make yourself and a great conversation piece at a small gathering at your house. I wouldn’t try to make this if you were having lots of company over unless you wanted to be brewing coffee the whole time, lol!